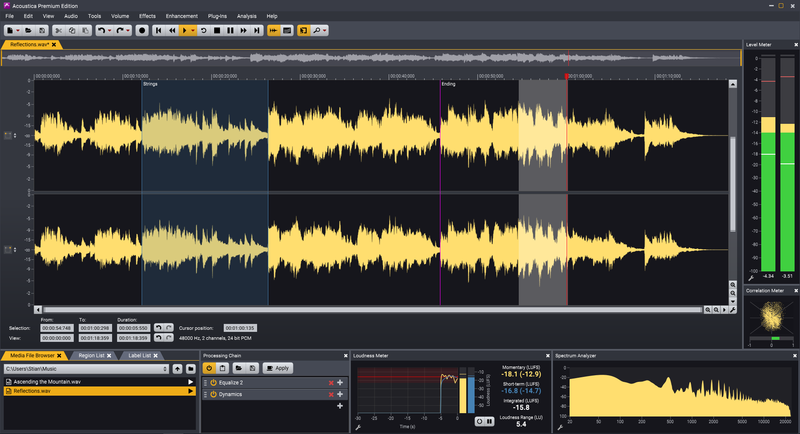 We have released version 7.1 of our powerful audio editor Acoustica for Windows and Mac. Acoustica is available in a Premium Edition and a lower cost Standard Edition. The Premium Edition now comes with an extensive collection of VST, VST3, AAX and Audio Unit plug-ins for use in third party host applications. Included are already commercially available plug-ins such as Equalize 2, Verberate and Restoration Suite as well as new plug-ins covering dynamic processing, mastering, effects processing and audio restoration. The new plug-ins are based on audio processing tools already present in Acoustica 7.0 with significant improvements in audio quality, workflow and versatility. A new Transfer plug-in for Pro Tools users makes audio transfers between Pro Tools and Acoustica a breeze, thus expanding Pro Tools with an extensive set of tools for audio restoration and processing. Further improvements are found in the Retouch tool which now offers a new Replace mode along with the previously available Attenuate mode. Both the Standard and the Premium Editions benefit from the new multi-threaded processing in the Batch processor which reduces the processing time on multi-core CPUs. The window docking system now offers detachable window panes which can be placed on different monitors. The audio output from the clip editor is now routed through the Processing Chain. The whole chain can be enabled or disabled using a power-on button. Voice-over actors will enjoy the new pre-roll feature which simplifies re-recording of phrases that need improvements. Acoustica 7.1 is available in a Premium Edition ($199.90 USD) for advanced users and a feature limited Standard Edition ($59.90 USD) for beginners. The upgrade is free for Acoustica 7 customers and owners of Acoustica 5 and 6 are entitled to reduced upgrade prices.